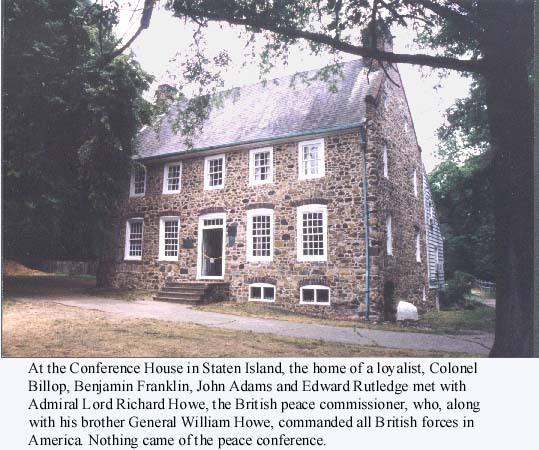 Shortly after the fall of New York to the British, the Conference House was the site of peace talks between General Howe and three prominent representatives of the Continental Congress - Benjamin Franklin, John Adams and Edward Rutledge. 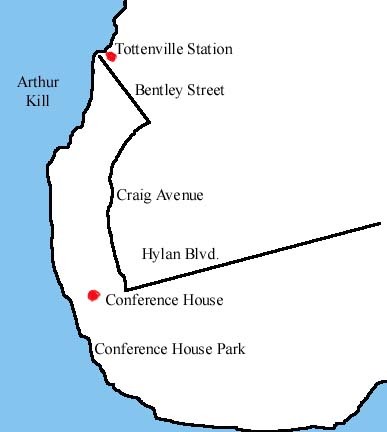 Having beaten the Americans and taken the key city, Howe thought he was entitled to a peace settlement. 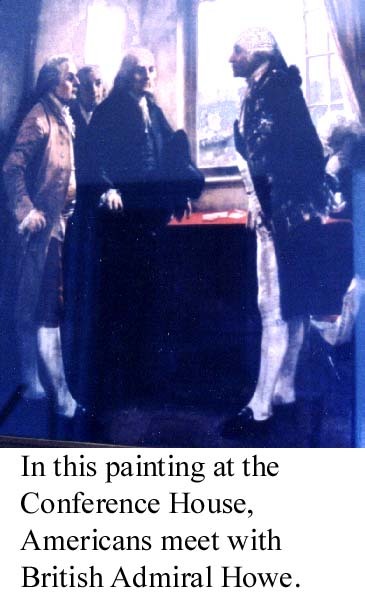 He asked for a conference and the prominent Americans, representatives in Congress of New England, the middle colonies and the South, were brought over on a boat from Perth Amboy. The Americans, having declared independence in July, considered separation from England as non-negotiable. The conference of Sept. 11, 1776, ended and the war continued for seven years. The house was built by British naval Captain Christopher Billop in about 1680, and was owned by his great-grandson of the same name during the revolution. The house is something of a testament to the difficulty the British had in holding the many miles of shore in the New York area during the long war. The younger Mr. Billops, a Tory colonel, was twice captured by parties of Americans raiding across the Arthur Kill from New Jersey. After the two episodes, Col. Billop gave up trying to live in what is now the southernmost point of New York City. Hours: Wednesday through Sunday, 1 p.m. to 4 p.m., March through December. Fee: $2 adults, $1 children and seniors.